Influenza results from infection by any of three types of flu viruses: types A, B and C. Type A infections are most common and cause the most serious disease. Type B influenza is usually associated with a mild form of the disease and is more common in the pediatric population. Type C is rarely seen. Wild aquatic birds are the primary reservoir for the influenza A viruses. The virus replicates preferentially in the intestinal tract of these birds. Most subtypes of influenza A virus cause no signs of disease in the waterfowl. Wild ducks excrete high concentrations of the virus into water, and the water supply is often shared with other species like chickens, pigs and humans. 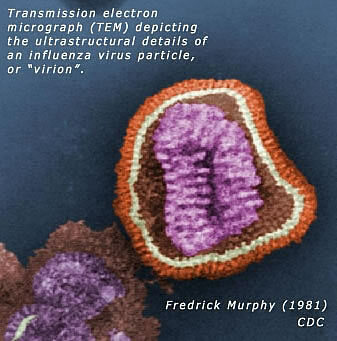 It is hypothesized that all mammalian influenza A viruses are derived from the avian reservoir. Type A is the most serious of the three influenza viruses.